A glorious waste of time. 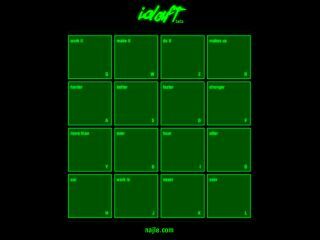 It might have zero creative value, but Matias Najle's 'idaft' Daft Punk Console is one of the most diverting internet oddities that we've seen for a long while. The concept is simple: put all of the vocal samples from the duo's Harder, Better, Faster, Stronger onto a four-by-four bank of virtual drum pads and then let anyone who wants to trigger them from their QWERTY keyboard. Hold down keys for some nasty repetitions, or press two keys at a time for polyphonic robotic madness. Give it a try - and don't be surprised if you're still trying it half an hour later. Click here to open the Daft Punk Console.